The Sun, June 01, 1999 -- Kuala Lumpur: Two workers from a pig farm in Sungai Buloh New Village, Selangor have died of the Nipah Virus infection, bringing the death toll to 103, a spokesman told Bernama. More. The Star, May 28, 1999 -- I refer to the articles entitled "Killer Unmasked" and "Doubtful Diagnosis". The articles seemed to cast doubts on the ability of the Ministry of Health to diagnose and control the disease outbreak. Allow me to try to explain... More. The Star, May 24, 1999 -- A name that is bandied too often remains etched in the mind, as evident in the present pig-related viral outbreak that was attributed to the Japanese encephalitis (JE) virus which is spread by the Culex mosquito. It is now known that the Nipah virus had been at work in the majority of deaths all along. Pix: Dr Henry Too: "JE diagnosis no longer logical." More. The Star, May 24, 1999 -- Just finding antibody to a virus in a single serum sample does not confirm anything, says Prof Charles Calisher, a microbiologist at the Colorado State University in the United States, on ProMED (http://www.healthnet.org), an online forum for emerging diseases. More. Pro MED Posting, May 20, 1999 -- Researcher suggests testing tree shrews as a healthy tree shrew (Tupaia belangeri) captured in 1978 in the area around Bangkok, Thailand was found with a novel paramyxovirus. More. AFP, May 19, 1999 -- New evidence suggests that fruit bats could be the cause of a deadly outbreak of encephalitis which recently swept through Malaysia, killing about 100 people. More. The Star, May 17, 1999 -- Private veterinarians here were surprised by the news that 20 dogs from the Ipoh SPCA would be put down after testing positive for the Nipah virus. More. The Star, May 11, 1999, Seremban -- Wreaths and bouquets of flowers and condolence massages covered part of the hall at Chung Hua Independent High School on Sunday when 1,000 people attended a three-hour memorial service for those who died of the viral outbreak in Bukit Pelanduk, Port Dickson. More. New Straits Times, May 11, 1999, Ipoh -- All horses used in the filming of the 20th Century Fox Production's Anna and The King here will be screened for the Nipah virus as they were located in a high risk area. More. The Star, May 11, 1999, Kuala Lumpur --The Health Ministry will continue active case surveillance even though the World Health Organisation declared the viral encephalitis outbreak which killed at least 100 people as "virtually over". More. The Star, May 11, 1999, Johor --Twelve people have been warded in Kulai Hospital for observation as a precaution against the Nipah virus. More. New Straits Times, May 11, 1999, Ipoh -- The Veterinary Research Institute will continue to monitor high-risk pig farms and the abattoir after the Nipah virus was at a farm at Kampung Coldstream in Bidor, and two farms in Kuboi near Kampar. More. AFP, May 10, 1999, Kuala Lumpur -- Malaysia is to extend its mass pig culling to the eastern state of Kelantan after 40 pigs there tested positive for a deadly virus. More. The Star, May 09, 1999, Johor Baru -- The Health Ministry has appealed to the seven Seelong pig farm workers to admit themselves to the Kulai hospital for observation as a precaution. More. Reuters, May 09, 1999, Manila -- A viral epidemic that has killed more than 100 people in Malaysia since October appears to be over, the World Health Organization (WHO) regional office in Manila said. A WHO statement Saturday said the selective killing of nearly 900,000 pigs in two pig-breeding regions in Malaysia had effectively eliminated the reservoir of the deadly virus ``and brought the outbreak to an end.'' More. AP Wire, May 07, 1999, Ipoh -- An outbreak of viral encephalitis that has killed more than 100 people in Malaysia has spread to a new part of the country despite government efforts to control it, an official said Friday. More. The New Straits Times, May 06, 1999, Ipoh -- Two of the 100-odd horses used in filming Anna and the King died after ingesting herbicide and not of the Nipah virus infection as was feared. Neither are horses belonging to the Perak royal family infected More. The Star, May 06, 1999, Kuala Lumpur -- The Government will consider appeals from pig farmers to increase the compensation from RM50 to RM200 a pig, said Transport Minister Datuk Seri Dr Ling Liong Sik. "We will see what we can do (but) we make no promises," said Dr Ling, who is also deputy chairman of the Cabinet task force following a protest Tuesday. More. The Sun, May 05, 1999, Kuala Lumpur -- Five hundred farmers stage a protest at MCA HQ. They stayed for eight hours, unfurled banners and marched with placards to press their case for higher compensation for destroyed animals. More. 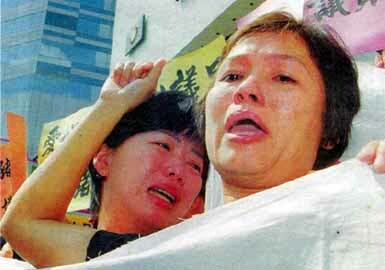 AP, May 04, 1999, Kuala Lumpur -- Some 500 pig farmers demonstrate at the party headquarters of the Malaysian Chinese Association, in downtown Kuala Lumpur, Malaysia, to show their anger over what they call the poor response to the killer virus that has destroyed their pigs and livelihoods. More. Sydney Morning Herald, May 04, 1999, Ipoh -- Amid reports that the deadly Nipah virus has spread to dogs, cats and horses in Malaysia, despite the mass slaughter of nearly a million pigs in infected areas, an Australian scientist has warned that wildlife could carry the virus to other countries - even as far as Australia. More. Associated Press, May 03, 1999, Atlanta -- In a quarantined laboratory, U.S. scientists outfitted in plastic biohazard spacesuits and breathing through air tubes are probing a killer virus that has struck on the other side of the world. More than 100 people in Malaysia have died in seven months, and scientists are baffled about its origin and mode of transmission. More. The Star, May 04, 1999, Ipoh -- The Ipoh Society for the Prevention of Cruelty to Animals has stopped taking in stray dogs and cats for the time being as a precaution. A spokesman says it was "most unlikely" for the animals under its care to be infected with JE or the Nipah virus as the society pound was located in an isolated area across the hills off Jalan Gopeng. More. Washington Post, April 29, 1999, Bukit Pelandok, Malaysia -- This hamlet of automotive shops, grocery stores and sprawling pigsties behind wooden fences now has the look and feel of a ghost town. Its inhabitants -- the ones who haven't died -- have mostly fled, and hundreds of thousands of pigs have been slaughtered, herded into a pit where they were shot, clubbed and suffocated. A stench still hangs over the town, as overpowering as the eerie silence. More. AFP, Apr 29, 1999, Ipoh -- Thousands of horses in Malaysia faced blood tests and a polo club in northern Perak state has been placed under quarantine after two horses tested positive for encephalitis. More. The Sunday Star, Apr 11, 1999, Seremban -- The virus which has crippled the pig-rearing industry and believed to have killed many people now has a name - Nipah - which is the name of the village in Negri Sembilan where it was first detected. More.